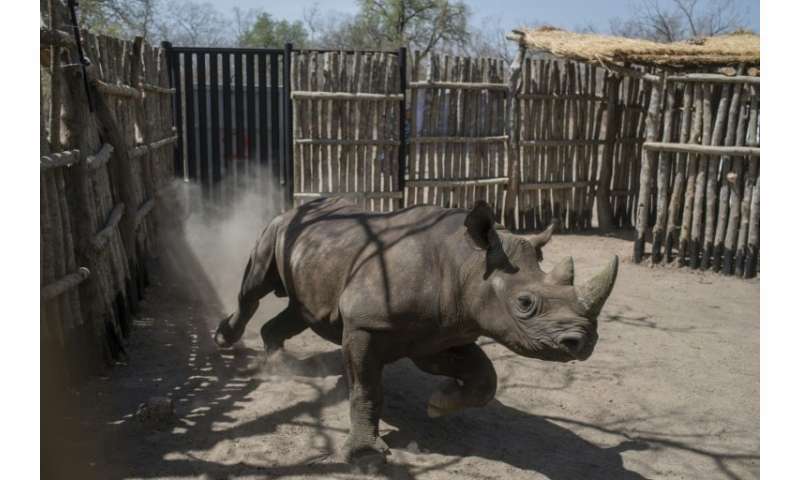 Conservation tragedy: Six endangered black rhinos were introduced to Zakouma National Park in Chad in May. Four of the animals have now died, but not from poaching. Four out of six South African rhinos that were transferred to a park in southeast Chad in a bid to revive the endangered species have died, but not from poaching, conservationists say. They were put on a 3,000-mile (4,800-kilometre) flight from South Africa, accompanied by a team of vets. Blood samples showed exposure to trypanosomes—a parasite transmitted by tsetse flies—but this is not suspected to be the cause of the tragedy, it said. "Low fat reserves suggest that maladaptation by the rhinos to their new environment is the likely underlying cause, although tests to be undertaken on brain and spinal fluid may shed additional light on the exact cause of deaths," it added. The species is rated as critically endangered by the International Union for Conservation of Nature (IUCN). Northern white rhinos disappeared from Chad several decades ago and the last western black rhino was recorded there in 1972, after decades of poaching pushed both subspecies to local extinction.